Dragons are cool. 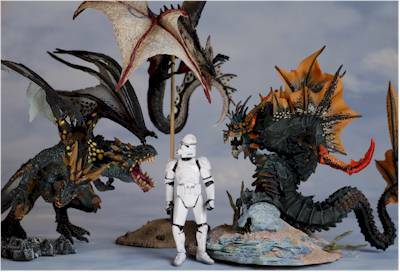 Like pirates, and zombies, and dinosaurs and ninjas, dragons have always been and will always be cool. Mcfarlane Toys realized a couple years ago, that as cool as they are, nobody was doing them in plastic 'action figure' form. So they set about correcting the oversight with their Dragons line. Series 4 is about to hit shelves, and is likely to be just as popular as the first three waves. 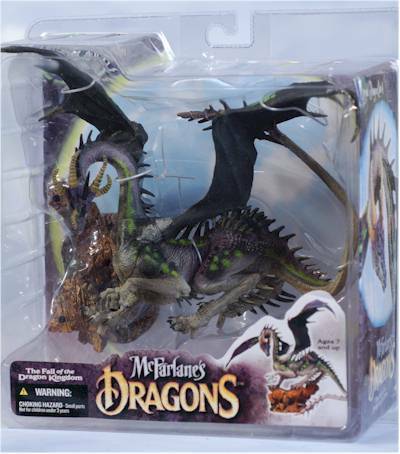 McToys was smart enough to realize that just doing Dragons wasn't good enough - they needed some back story. So they developed a mythology for their line around different clans, and their relationship to each other, to the elements, and to humans. 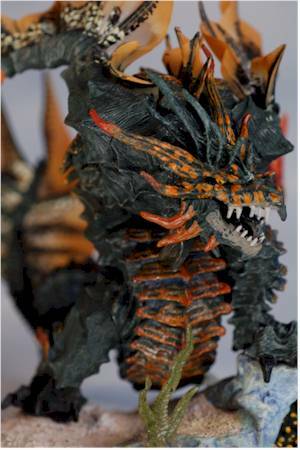 This series includes versions of all six clans - Berserker, Eternal, Fire, Water, Komodo and Sorcerer. The Komodo version is actually the deluxe boxed set, and I'll have that review up separately this week. I have lots of good online suggestions for you at the end of the review if you're looking to buy, and they should also show up at your local Toys R Us. Expect to pay around $12 - $13 a pop, and yes, the price went up between series 3 and 4. They come in the usual clamshells, with paper inserts. The graphics are attractive, although including additional back story would be nice. You have to really go to the web site to get it all. You can see the dragon pretty well, but it's hard to position any of them in such a way that you can really appreciate them. I find with all of these that in the package they're okay, but out they're a whole 'nother story. 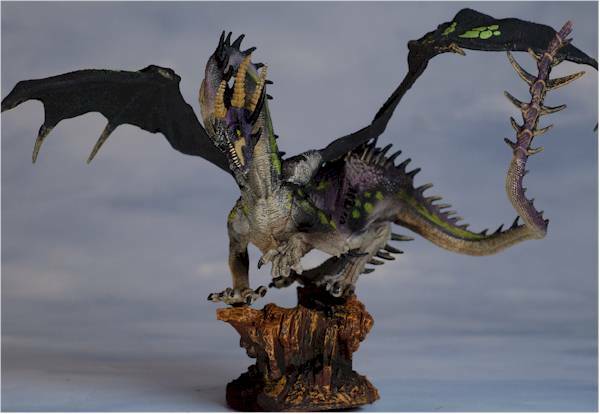 When it comes to the Dragon line, it sports the same high quality sculpts that you expect from any Mcfarlane line. 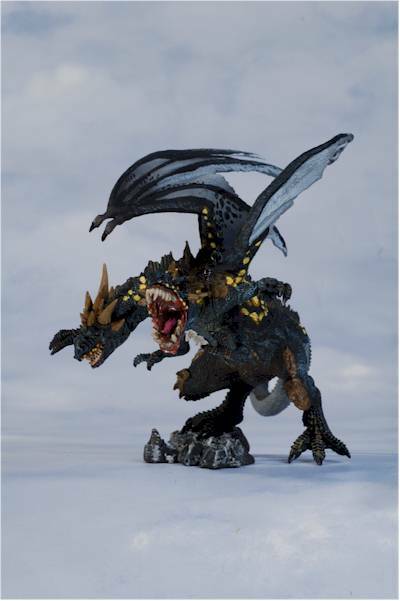 Which dragons are your favorite in this category is going to be quite personal, since the sculpts are all technically excellent. 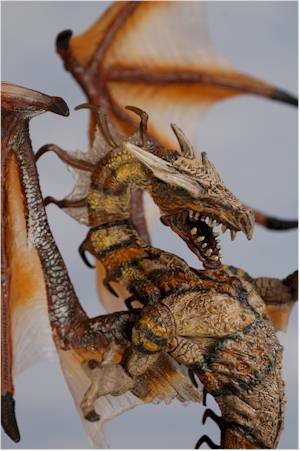 There's tons of small detail work, and textures are carefully used to distinguish between the skin, leather wings, and rocky bases. The size and type of scales on the reptilian bodies varies from dragon to dragon, and even from one area of their body to the next, making them extremely realistic. Once you get past the technical expertise, you're left with art. 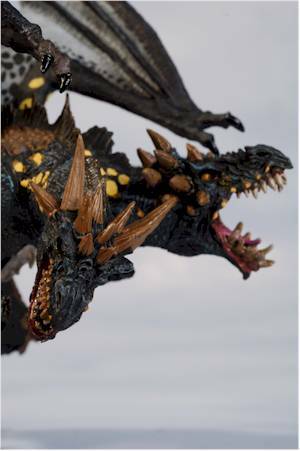 Each dragon is posed, and while there's a little articulation, it's not enough to vary the sculpted pose in any meaningful way. Which pose, combined with which style - fire, water, eternal, beserker or sorcerer - will dictate which ones are your favorites. 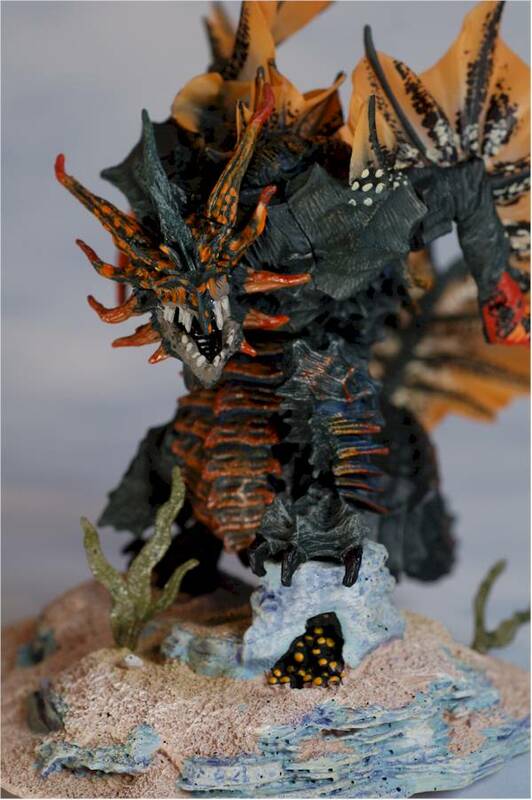 For me, the sculpt on the Water Clan dragon is the most impressive. Partly this is due to the unique style, with large plate like scales. He has a very sea serpent feel to him, and rather than flying, is built for swimming. That's not to say that either the Berserker or Fire dragons are slouches. 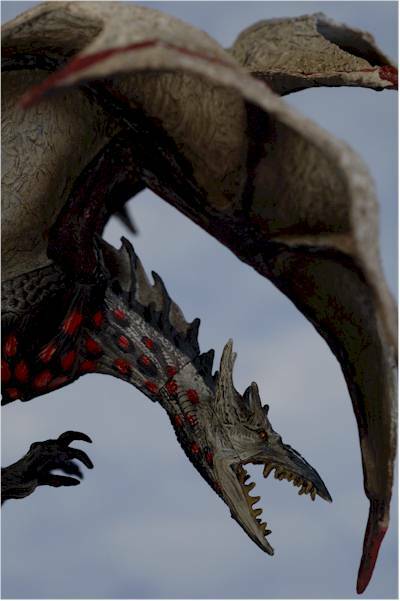 What's better than a snarling, horned dragon? 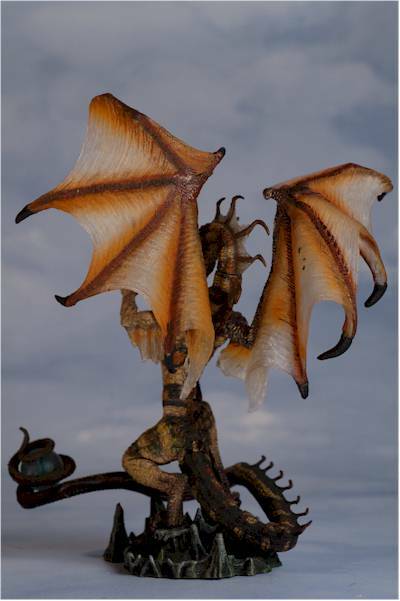 Why, a two headed snarling horned dragon of course! And that's what we get with the Berserker, sculpted in a pose coming at you with everything he's got. Both heads, all four arms, and even the claws on his wings are posed reaching out to someone in front of him, caught in the heat of battle. The Fire Clan is posed attacking from the air, the only one in this series that is. You'd assume dragons would spend a lot of time in the air, but in this series it's only the Eternal Clan that is captured in that state. He's also the most bird-like in appearance of the wave, lacking any arms other than his wings, and having a very beak-like mouth. The other two look good, but just aren't quite as cool on my shelf. The Eternal Clan has a rather odd pose, with his neck bent in a very unusual way. He's also the most friendly appearing of the set, although I wouldn't go so far as to say he isn't about ready to rip your head off. The Sorcerer Clan is generally my least favorite, usually because they are the most anthropomorphic. This time, the dragon has his tail wrapped around a crystal ball, and has the most human stance. That being said, he's my favorite of the Sorcerer's to this point, and I love the hard plastic translucent wings. The paint work on all five of these is excellent, with a great use of color and shading to make these stand out, even with the other three waves already on the shelf. Again, the Water Clan is my favorite. 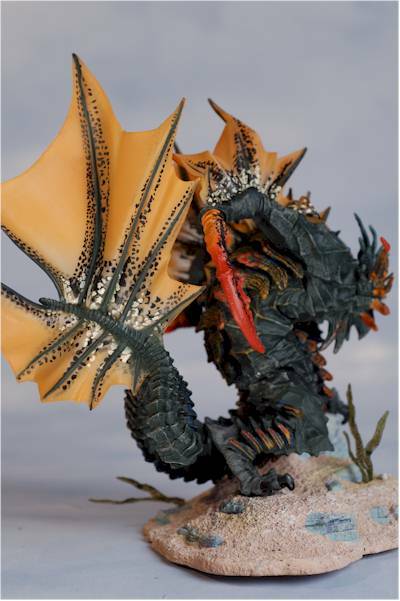 The cool, slightly translucent, hard plastic wings are an excellent deep sea shade of orange, with lots of bright colors splashed in various patterns. He looks like he's right at home on a coral reef with the other exotic fish. My second favorite is actually the Sorcerer this time around. As I mentioned, his wings are uber-spiff, with some beautiful paint work highlighting the clear hard plastic. The other three are all well done, with clean neat lines, nice transitions between colors, and far more operations than you generally see on figures in this price range. The amount and usefulness of the articulation varies quite a bit across the wave. The Fire Clan has a cut neck, cut hips and two cut joints in the tail. The wings aren't going anywhere, so it's good that the sculpted pose is so well done. The Water Clan has a cut neck as well, although it's a little restricted by the sculpt, as well as cut shoulders, cut forearms, cut hips and a cut waist. His tail has two cut joints as well, and allows for quite a bit of tail posing. That's handy since he has such a damn cool fan tail to begin with. The Sorcerer has a cut neck, cut shoulders, and cut waist. I had the most trouble freeing up his joints of the set. His tail also has two cut joints, allowing to pose that long sucker in quite a few ways. The Eternal Clan has a cut neck as well, very close to the body. There's also cut front shoulders, and a cut joint at the base of each wing. Rather than cut joints on his tail, he has a bendy tail. The Berserker Clan dragon sports the two cut joints on his tail, although his is the shortest of the bunch. I bet the tail envy with the Sorcerer is almost too much to bear. He also has cut joints at the base of the wings, on both hips, at the shoulders of all four arms, and on both necks, making him the most articulated of the bunch. The majority of the articulation is intended to get them in one pose and keep them there. 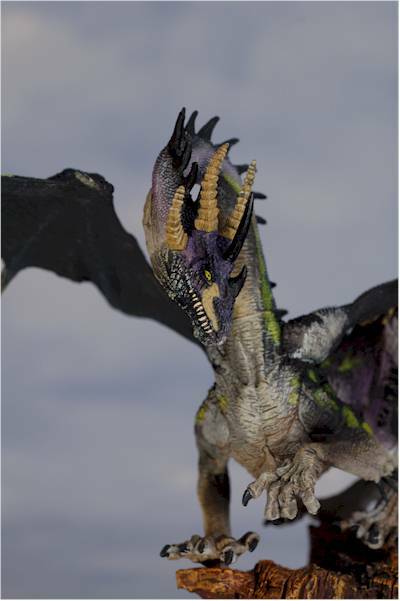 The tail articulation is the most useful across the group, but the cut wings on the Berserker and Eternal Clan dragons is useful as well. Each figure comes with a base, all of them fairly small. Of the five, the Water Clan is clearly the best, with more area, some cool underwater plants, and even some eggs that he is guarding. Of course, I keep calling him a 'he', but odds are pretty good this is one ugly chick dragon. 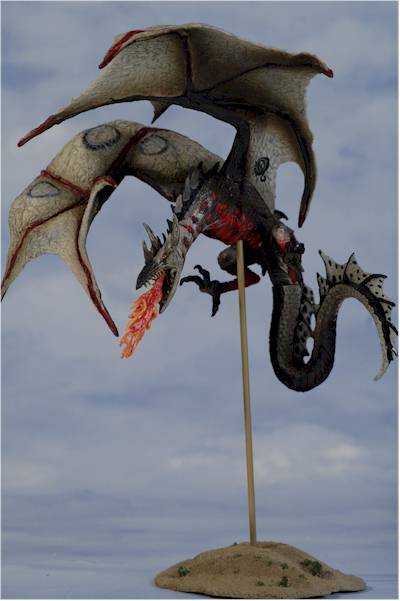 It's also worth noting that the rod that holds the Fire Dragon suspended in the air is just painted brown, but is in reality made of steel. No wilting here! Of course, it'd be nice to get some extra accessories in there, and the Fire Clan Dragon does come with a little plastic flame for his mouth. You're better off leaving it out though, because it doesn't look all that great in place. At ten bucks, these guys are a great value. At $12 - $13, which is the going rate these days for specialty market figures, not mass market, they aren't quite as thrilling. However, once these hit retailers like Meijers, who have been traditionally cheaper than even Toys R Us, you might have a shot at picking them up with a ten spot. If that's the case, you can add another half to even a whole star to this category. 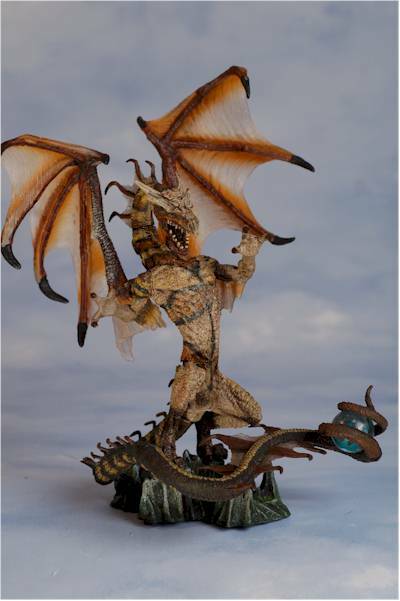 A couple of these figures, particularly the Sorcerer Clan Dragon, had stuck joints that were quite difficult to free up. Take your time with them, because the plastic is soft enough to twist to a point of breaking. 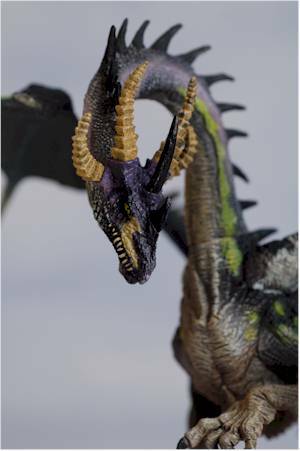 The Dragons series appears to be one of the most popular general Mcfarlane lines out right now, right up there with the Military line. 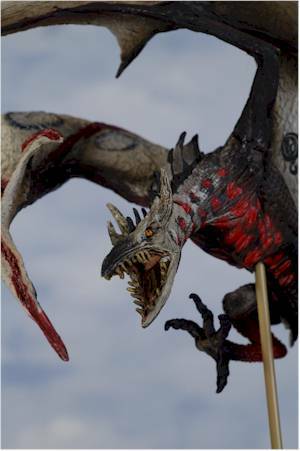 While the general idea isn't particularly unique - you can find dragon statues in just about any gift shop - these are some of the nicest you'll find, especially at this price point. 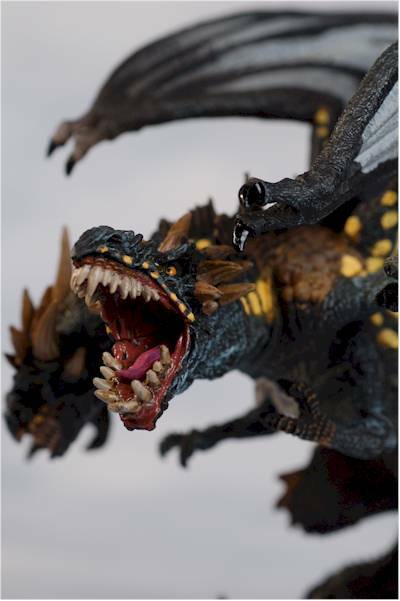 Mcfarlane is able to capture reality like very few companies can, even when the subject is as unrealistic as dragons. The Water Clan was my favorite this time around, but that's pretty common for me. I think the whole sea serpent thing is a big plus, since I was fascinated by tales of the Loch Ness Monster as a kid. Both the Fire and Berserker Clan dragons are pretty sweet as well, and even the Sorcerer (a clan I'm not usually too fond of) turned out great. - Clark Toys has the singles for $13, or the set of 5 for $60 - or a case of 12 at $115. - Killer Toys has the set of 5 for $65, a case of 12 for $117, and the deluxe for $23. - Entertainment Earth has the case at $140, or the deluxe at $28. 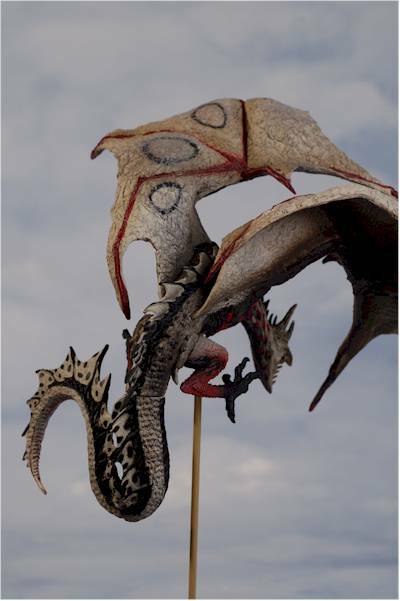 - the Mcfarlane website has a nice section on these, with their own photos and info. - I've reviewed past waves including the deluxe figure from the first wave, and a guest review of the rest of wave 1. 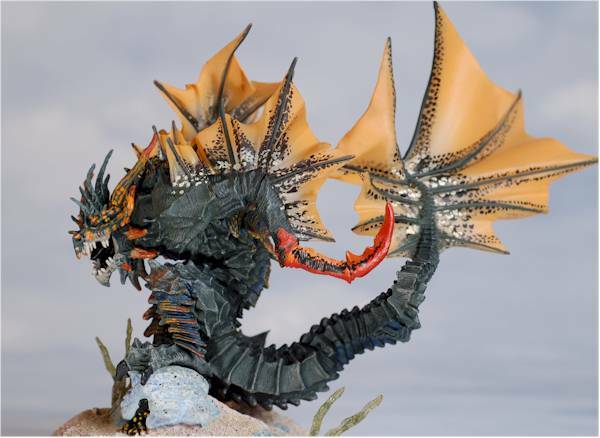 - and if you're a fan of dragons in general, there's the cool Hungarian Horntail Dragon from Gentle Giant, Singe from the long ago Dragon's Lair line, or even the cool Megablok Dragons.